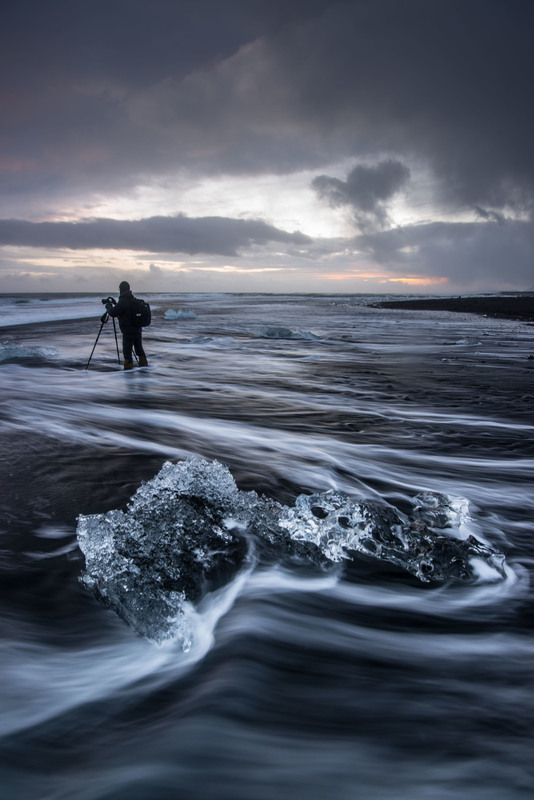 With endless waterfalls, glaciers, towering mountains, wild horses and the worlds only black beach covered in "diamond" ice chunks, photographing the extreme landscape across Iceland is a photographers dream. We speak from experience when we say it has been a highlight in both of our careers. 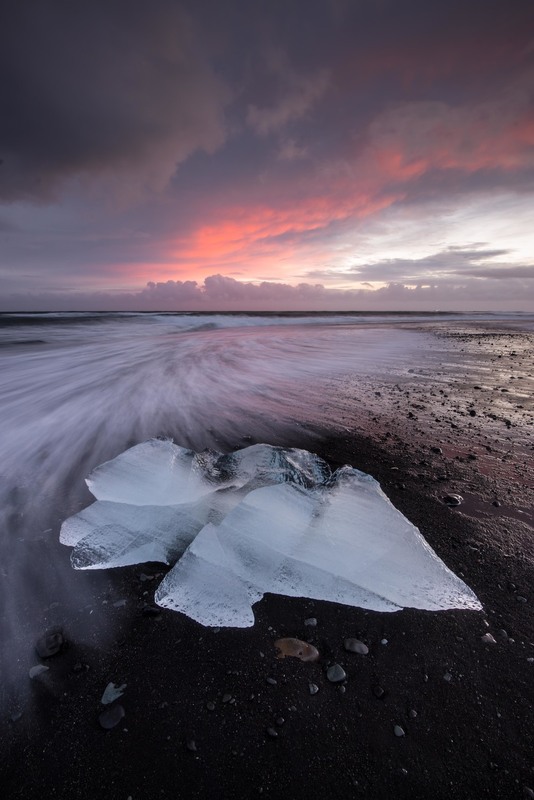 Iceland undergoes many different seasons, offering a variety of photographic advantages in each. We are choosing to shoot in the winter months to take advantage of the extended "golden hour," in which the sunrise and sunset hours overlap one another and bathe the landscape in golden light for numerous hours throughout the day. During this season, there are also possibilities of chasing Northern Lights and exploring Ice Caves formed beneath ancient glaciers. We welcome you to explore, experience and enjoy Iceland with us. We are excited that you want to join us! We will contact you as soon as possible to secure your reservation for this workshop. Participants: Available to 8 participants. Four to one guide ratio. Open to beginner to advanced photographers. Transportation: Aside from air travel, all transportation is included. Lodging: All lodging is included. Most of our lodging arrangements are in house rentals. Rooms are double occupancy. Limited single occupancy available for an additional $900. GUIDED ICE CAVE FEES: We work with a fantastic guide company in Iceland. Our days in the ice cave is a full-day experience that includes transportation, guide fees and all necessary gear for the day. INSTRUCTION: CUSTOMIZED INSTRUCTION IS A HEAVY EMPHASIS ON THIS WORKSHOP. WE WORK HANDS-ON WITH PARTICIPANTS EVERY DAY OF THE WORKSHOP IN ORDER TO HELP PEOPLE CREATE IMAGES THAT ARE MEANINGFUL TO THEM AND TO HELP THEM CAPTURE THEIR VISION. POST PROCESSING INSTRUCTION AND FEEDBACK: we do post-production sessions most evenings after we’re done shooting for the day. we will be working primarily in lightroom on your images from the day in order to bring them to life and ready for print or for web use. Food: Food is not included. Many areas that we will be staying will be close to restaurants. People have the option of eating out, or participating in group meals in the homes we'll be staying in. We estimate the cost of food will be around $600, this will include the meals made at homes as well as eating out. BLUE lagoon: the blue lagoon is a resort-like hot spring experience. Some participants like to do this on the last day, while others prefer to spend a little extra time shooting around this unique hot spring. For information on the hot spring and spa options along with pricing you can click here. Day 1 - Guests will fly in the night before the workshop starts, and stay at the Airport Hotel Aurora Star. We will meet the following morning in the hotel lobby, we will load up and get straight into shooting. 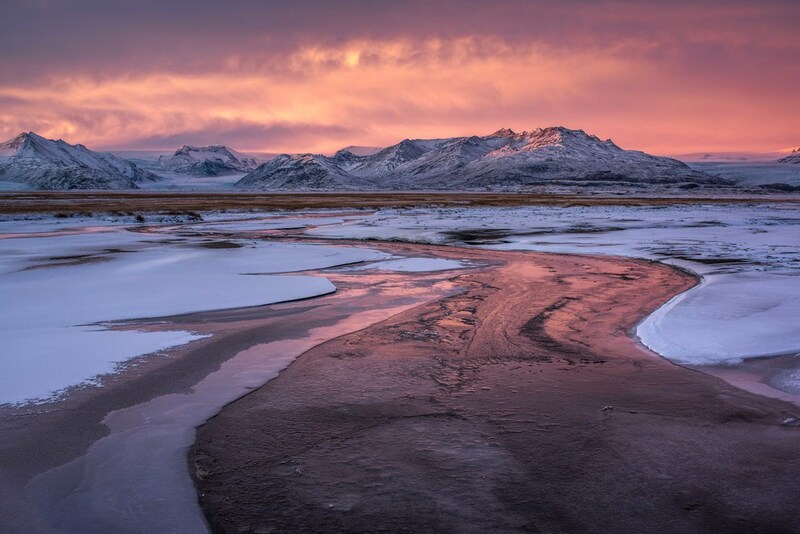 Although we have specific photography destinations, we will take time chasing the light along the Snaelfessness peninsula, eventually ending up at Iceland's iconic Mt. Kirkjufell. One major advantage to visiting Iceland during this time of year is that the position of the sun allows for 6 hours of "golden hour." Day 2 - On our second day we will photograph Mt. Kirkjufell and the Snaelfessness Peninsula area during sunrise hours before getting on the road to head back towards Reykjavik where we will stay that evening. One of the wonderful things about Iceland is that the entire island is photogenic! We are always driving towards a photo destination, but often times the best images come from simply seeing a beautiful scene from the car, pulling over and capturing what is being bathed in beautiful light. Day 3 - This will be our first day experiencing the "South Coast" of the island. The drive is wonderful, and the scenes are plentiful! Massive waterfalls, black sand beaches, and towering seaside cliffs create opportunities for quality all-day shooting. In addition to the numerous iconic areas that we will photograph, we will find many scenes along our drive which will make for wonderful images. We have set aside 2 days to photograph the glacier lagoon and surrounding areas. This site is so incredible and serene, we could easily spend a lifetime shooting here. 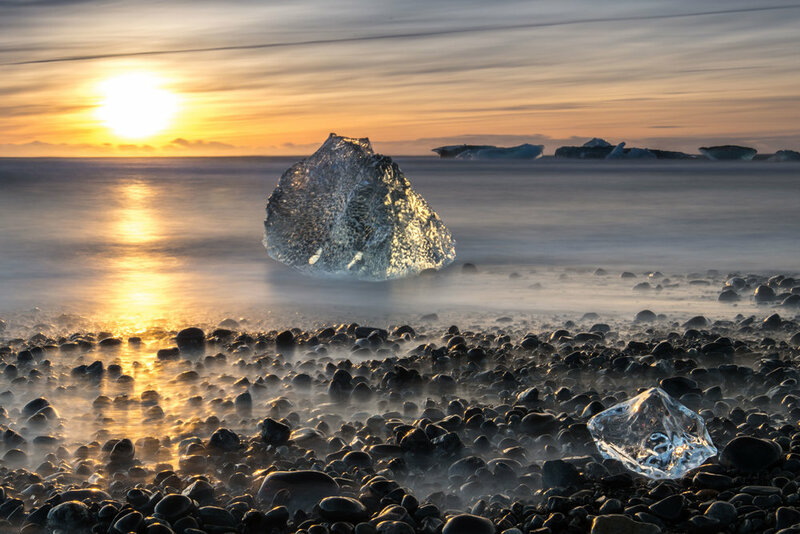 The Jökulsárlón Glacier Lagoon is formed by ancient icebergs slowly melting and breaking off from Europe's largest glacier, Vatnajökull. Just minutes away is the famous “Diamond Beach” named for the ice chunks that have floated from the lagoon out to the sea. They are then polished by the tide and washed on the sea shore, creating endless photographic opportunities. The Diamond Beach is the only place in the world where this phenomenon occurs. Weather dependent, we will have the unique opportunity to join a local guide in exploring the magnificent blue wonders only seen inside an ice cave. Day 7- We will travel from the Jökulsárlón Glacier Lagoon to Vik shooting all along the way. This will give us the opportunity to shoot spots we visited earlier with different conditions or shoot shots we passed earlier in the week. Day 8- On our final day we will depart from the town of Vik and make our way back towards the Reykjavik airport. We will have some time to shoot sunrise at Vik or the surrounding waterfalls before we make a final stop at Icelands famous “Blue Lagoon” near the Reykjavik Airport. For those whose trigger fingers are not yet burned out, the lagoon is quite photogenic with it’s aqua colored water. For those who are needing to soothe the body, these geothermal pools that average 100 degrees fahrenheit are the perfect way to relax and soak in more of that rich Icelandic experience before boarding the flight back home. We will depart the Blue Lagoon in plenty of time to get everyone to the airport on time. If you are ready to join us on this amazing adventure or have any questions, please fill out the form below. We would love to chat with you.